Omniquad AntiVirus TS 3.0.0/A free download. Omniquad AntiVirus virus detection engine provides protection from new and more complex virus threats that are appearing. 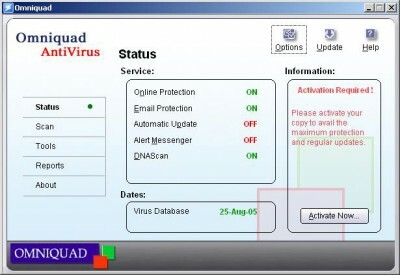 Omniquad AntiVirus virus detection engine provides protection from new and more complex virus threats that are appearing. It automatically protects you from viruses, worms, Trojans and backdoors. Omniquad AntiVirus will continuously scan through your system in background and prevents virus infection from files coming in through email attachments, instant messenger, Internet downloads and through vulnerability exploits. Omniquad AntiVirus also scans for certain non-virus threats like spyware, adware, riskware and other attack tools. Cleans virus-infected files automatically or quarantines them. Omniquad Desktop Booster effectively recognizes how you use your computer, and which files and programs you access, before creating easy shortcuts on your desktop. ErgoSense is an analyzer application that uses your computer to recognize RSI and eyestrain. Principal AntiVirus is powerful antivirus program which protects your Windows computer against a large range of threats including viruses, worms, trojans, backdoors, adware, spyware and other malware. F-Prot includes the RealTime Protector, a memory-resident monitoring utility observing all files accessed on your system, a Scheduler where automatic scans or updates on your system can be set with the Scanner at any time and an Updater to manage all signature updates. Steganos AntiVirus 2006 protects you when you surf the Internet and also when you send or receive e-mails. ID AntiVirus is an extremely important program designed to protect your computer against outside threats targeted at your operating system. Protea AntiVirus Tools for Lotus Notes/Domino scans and cleans automatically message body, attached files, rich text fields and OLE objects in Domino mail, keeps Domino bases virus free.